Nirmal Ojha, a family man living in Jaipur, was living his life to the fullest his liveliness was affected when he was diagnosed with a serious congenital heart disease. From past 3 years, he has undertaken heart treatment,but recently his heart’s veins are getting narrowed and blocked, which made doctors to advise for a major heart surgery. 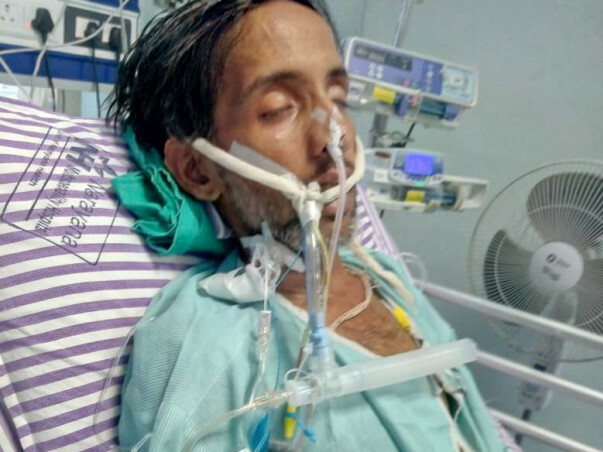 At this time, his condition is critical, his kidneys have also surrendered, and he is under dialysis on alternative basis, and requires immediate heart surgery. But the only thing is he can’t afford the treatment. Although, with lots of hard work and savings, he has been able to manage a good percentage of the amount, still needs support to reach the surgery charges around 10.5 lacs. in a month which is beyond his family means. 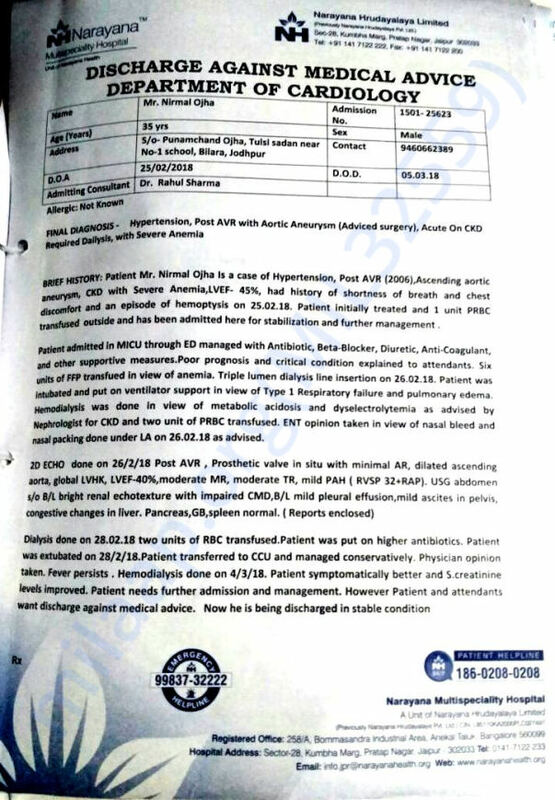 This estimate has been given by the doctors at Narayana Hospital, Jaipur , where He was undergoing treatment. 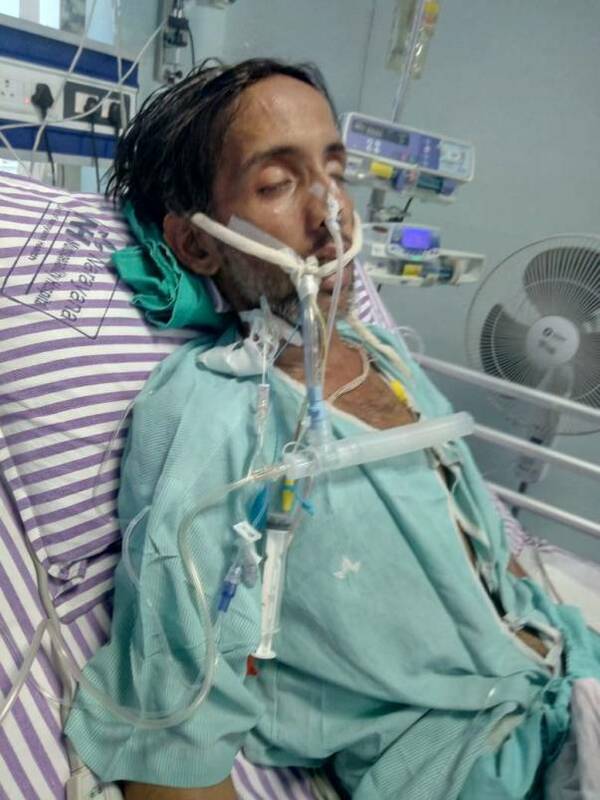 Nirmal was admitted to Narayana Hospital, Jaipur and now shifted to hospital’s Bengaluru branch. He is a family man, having responsibilities towards his old parents, his wife and his 4 years daughter. He cannot leave all of them alone, his daughter does not deserve the loss of her father at this age. And your small contribution can bring a happiness to his family. Nirmal is under observation for 3 months after operation. He has been discharged from Narayana Hospital Banglore. Now he is living in Jaipur and further treatment is going on in Narayana Jaipur hospital. Doctors are doing dialysis twice a week. There is multiple check ups are going on each weeks so he still need money to continue his treatment. I am attaching latest reports / prescriptions / Bills from the Hospital. This couldn't have been possible without you. Nirmal has undergone the heart surgery and surgery was successful. His Heart is again working in normal condition. He is under post-surgery recovery and healing stage. Let us pray for his speedy recovery till stable condition. Thank you to Miaap platform and all the supporters and the well-wishers who helped us in this hour of need. Please do pray for his health and speedy recovery. Thank you! Thank you for your support and contribution. I'd like to inform you that Nirmal has undergone all the pre-surgery checkups. As this is going to be a major surgery so the doctors are waiting for his health to stabilise based on which they will be suggesting the future course of action. As Per current Reports status, they are expecting his surgery by this weekend or next week. Please share this link in your circle to help him more. We pray for his successful surgery, health and speedy recovery. Get well soon, Bro ! !